Click the button below to add the 3.5mm Female Audio Stereo Jack To RCA for DVR Audio Speakers to your wish list. When using our audio microphone input to any Zmodo DVR most times we forget about audio out to speakers so we can hear whats coming in on the line. If you look at Zmodo DVR's and most other brands the audio out is RCA. Most speakers you would like to connect to the DVR will be a male 3.5mm jack. With this female jack you simply plug in any set of speakers with a 3.5mm jack and it converts the cable to RCA which fits into the DVR. 1. 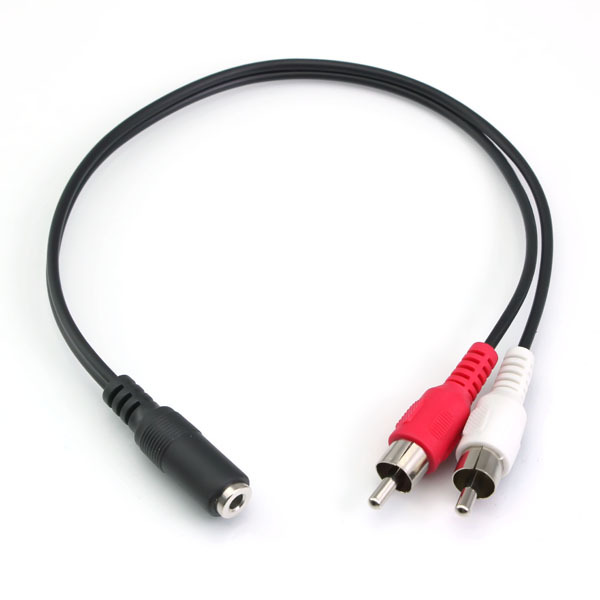 About 6 inches long, shielded 3.5mm 1/8 mini jack to 2 RCA stereo audio Y adapter cable. 2. One end of the cable has a female 3.5mm 1/8 stereo mini jack and the other end has two color coded male RCA plugs. 3. This cable will convert a 3.5mm 1/8 stereo mini plug into two mono RCA plugs (left and right audio channels).